Keep your wreaths and branches outside where its shaded, cool and moist, until you’re ready to use them. Soak wreaths overnight in water. 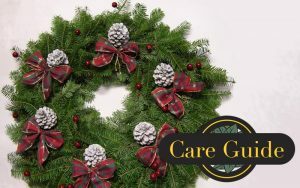 Treat wreaths and branches with an anti-desiccant (anti-transpirant) spray. De-sign Master Foliage Sealer also works. These sprays add a protective waxy coating to the needles or leaves of evergreens to slow the process of water loss. Spray all sides thoroughly. The exceptions to using one of these sprays include: avoid spraying the undersides of Magnolia leaves as it ruins the beautiful fuzzy texture; avoid juniper berries or blue spruce since the wax coating that gives these plants their distinctive color can be damaged; avoid Eastern Red Cedar (the native juniper) foliage because it will darken the foliage; and only lightly spray fine needles as it can make them stick together. Mist your evergreen branches or wreaths with water daily if possible. Keep away from heat vents and other heat sources, fire and direct sunlight. Use LED lights if lighting your greenery. For cut branches, crush the stems which allows them to take in more water, and immediately place them in a bucket of water overnight. Adding glycerin will extend the greenery life even more. Glycerin is an agent used to preserve ever-greens for several years (see the December 2018 Rockaway Newsletter for a how-to article). For arrangements in water, mix glycerin and water in a 1:1 ratio. Be prepared to refresh some greenery during the holidays. Check for freshness by bending the leaves and needles. They should be supple and not break. Pine, fir, cedar and juniper foliage last the longest indoors of the traditional greenery. They may last for several weeks given the care recommended above. Eastern Red Cedar (Juniperus virginiana) has a beautiful blue cast to its foliage with slight bronzing at the tips this time of year, a wonderful cedar scent and light blue berries. Western Red Cedar (Thuja plicata), also called arborvitae, has soft feathery fan shaped foliage which provides a lot of fill. Hemlock and spruce tend to dry out more quickly, losing their needles a little sooner with warm indoor temperatures. Of the spruces, Blue Spruce holds its needles best. Hemlock, spruces and most broadleaf evergreens will last longer if used outdoors. Hollies come in various forms with green or variegated foliage and red berries. Make sure that holly does not freeze after cutting, or the leaves and berries may blacken. Florida Anise Tree (Illicium floridanum) has aromatic foliage but may not last as well as some greenery. True cedars such as Deodar, Blue Atlas, and Cedar-of-Lebanon all have a wonderful fragrance. Small male cones should be sprayed with lacquer or acrylic to prevent the messy release of pollen at room temperature. Boxwood is a very popular small-leafed shrub that adds fine texture to wreaths and garland. Southern Magnolia leaves hold up well even without water. English Ivy may wilt fairly quickly unless in an arrangement with water but it still looks decent in a wreath, lending a very different texture. Some other broadleaf species to consider are ligustrum, pittosporum, podocarpus, viburnum and eucalyptus. Hollies, yews, mistletoe, ivy, Jerusalem cherry, bittersweet, nandina and crown of thorns can all provide attractive berries but some may present a poison hazard to people and pets. Be sure to discard any berries which fall off during decorating. For longer lasting wreaths and arrangements you can also incorporate branches and natural artifacts such as red or yellow twig dogwood, winterberry holly stems, acorns, magnolia pods, pine cones, reindeer moss, rose hips, dried flowers, dried citrus slices, millet sprays, sweet gum balls and even the interesting twiggy structures that hold the fruits of some palms. 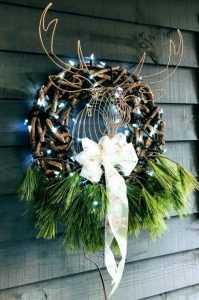 A final option for a long lasting wreath is to create one with minimal greenery, which can be replaced during the holidays.